Goom Goom is a Goomba found in Paper Mario: The Thousand-Year Door. After taking on his trouble, Mario discovers Goom Goom in the Pirate's Grotto's storeroom. Goom Goom is looking for a female companion, and, as such, Mario introduces his traveling companion Goombella to the lonely Goomba. However, Goombella rejects Goom Goom. Heartbroken, Goom Goom runs away, dropping a Couple's Cake on the way out. Goom Goom will only like Goombella; if Mario shows him a different party member, even if the party member is female, he will not like them and turn each one of them down. 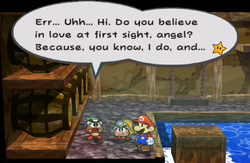 If Mario shows him a partner other than Goombella, Goom Goom will have a few sentences to say. On Koops: Whoa! That is one attractive shell...but that makes you...a Koopa of some kind. Not only that, but you're a dude. This is all wrong! On Flurrie: Whoa! Now that is a very glamorous woman, indeed... But you're kind of...old... And you're not even a Goomba! This is all wrong! Response: Well, I never! How rude! Go get your eyes checked, young man! I am a PRIZE! On the Yoshi: Whoa! Hey... You're petite, just like I asked... But you're a Yoshi! This is all totally wrong! Response: Hey, take a long walk off a short pier, you dork! Who'd date you, anyway? On Vivian: Whoa! You sure are cute... But, um... That whole goth shadow thing is a bit... Creepy! There, I said it! This is all so very wrong! Response: You're not really doing much to impress me either, bud! On Admiral Bobbery: Whoa! How very, um... What's WRONG with you, huh? This is some crusty old dude! Do I look like I date old Bob-ombs? This is all wrong! Response: Well, you're hardly my type, either, you young scallywag! On Ms. Mowz: Whoa! Well, well, well... This IS a cutie, oh yes... But you're some sort of rat! Close, but no Goomba! This is all so very wrong! Whoa! Yeah! Wow! Yow! She's cute! REALLY cute! And that ponytail! Man! Perfect! Slam dunk, man! Yes! Suh-lam duh-unk! This may be a bit soon... But I have to confess my love to this girl! "That's Goom Goom, who asked us for help, remember? Looks like he's enjoying life here on Keelhaul Key, but he's a bit lonely. By the way, you don't suppose I'd qualify as a cute Goomba gal, do you?" Kurichero Pun on Kuribō, Goomba's Japanese name and "Marcello", a common Italian masculine name. French Goombanova Cross between "Goomba" and "Casanova"
↑ "Paper Mario: The Thousand-Year Door: From Japanese to English". (June 1, 2014). The Mushroom Kingdom. Retrieved December 31, 2014. This page was last edited on February 17, 2018, at 17:56.